Chest injuries are responsible for 25% of all traumatic deaths annually. It is important for all EMS providers to be suspicious and vigilant when faced with a chest trauma patient. It is crucial for a person to have an intact thoracic cage for adequate ventilation to take place. A blunt thoracic injury resulting in inadequate ventilation, can quickly lead to hypoxia and hypercarbia. Acidosis and respiratory failure will ensue if emergency interventions are not initiated quickly. Blunt chest wall injuries include rib fractures from a single rib to a flail chest, as well as sternal fractures. Penetrating chest trauma can also cause hypoxia with hypocarbia as inspiratory pressures lost. Fractures of the first 3 ribs are uncommon; they are shorter, stiffer, and are protected by the clavicle, scapula and muscles of the upper chest wall. The presence of two or more rib fractures at any level on the thoracic cage is associated with a higher incidence of internal injuries. 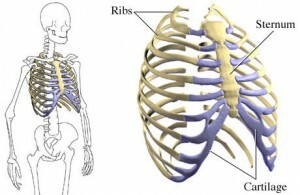 Ribs 4–9 are the most common ribs injured because they are exposed and relatively immobile. These ribs are attached to the sternum anteriorly and the spine posteriorly. Ribs 9–11 fx. are associated with a high risk of intra-abdominal injury, especially injuries to the liver and spleen. Sternal fracture and costochondral separation (separation of the sternum from the ribs) are often caused by anterior blunt force trauma. Because of the heart’s location directly posterior to the sternum, cardiac complications such as myocardial contusion can occur with a fractured or displaced sternum. Note: It is hard for us to grasp on scene but, a restrained passenger is more likely than an unrestrained passenger to suffer sternal fracture. A flail chest occurs when 3 or more ribs are fractured at two or more places, creating a free moving segment of chest wall moving paradoxically to the rest of the chest. Flail segments can be located anteriorly, laterally or posteriorly. A flail sternum can result from anterior blunt force trauma that disarticulates the sternum from all the ribs (costochondral separation). The work of breathing is increased by the loss of integrity of the chest wall and the resulting paradoxical movement of the flail segment. Tidal volume is decreased by the paradoxical movement of the flail segment compressing the lung on the affected side during inspiration. It is also caused by the patient’s reluctance/inability to take deep breaths because of the pain produced when the flail segment moves. Pulmonary contusions interfere with respiration resulting in atelectasis and poor gas exchange across the alveolar-capillary membrane. These factors contribute to developing inadequate respirations and hypoxia. 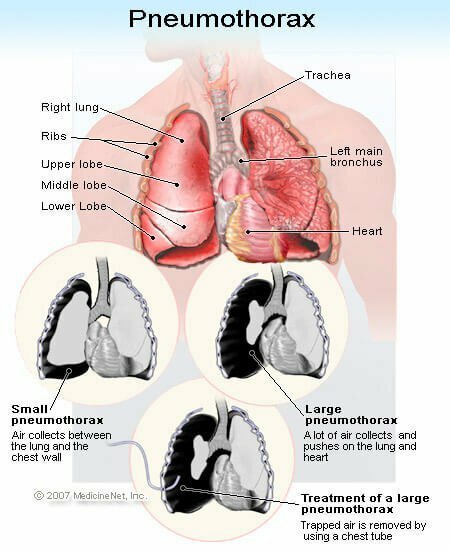 A pneumothorax occurs when air collects in the pleural space between the lung and the inside of the chest wall. It is a common complication of blunt and penetrating chest trauma that passes through the parietal and visceral pleura. A simple pneumothorax occurs when a hole in the visceral pleura allows air to escape the lung and collect in the pleural space. A simple pneumothorax is most often caused when a fractured rib lacerates the pleura. It may occur without a fracture when blunt trauma is delivered at full inspiration with the glottis closed (holding your breath). This results in a dramatic spike in intra-alveolar pressure and alveolar rupture occurs. Commonly known as, the paper bag syndrome. Treatment: patients will often be able to maintain their own airway and ventilate adequately. In such cases, administer oxygen via NRB @ 12-15 lpm (SpO2 of at least 94%). Place the patient on a cardiac monitor and establish IV access. Monitor EtCO2 if possible and immobilize the spine if warranted. Patients will rarely require BVM or intubation. A open pneumothorax occurs when a hole (normally larger than a nickel) in the chest wall and pleura allows air to collect in the pleural space. Air may move in and out of the hole in the chest wall with inspiration, resulting in a sucking chest wound. Treatment : Cover the penetration accompanying an open pneumothorax with an occlusive dressing taped on three sides. This effectively creates a one-way valve that will prevent air from entering the chest through the penetration during inspiration, yet allow air to escape during exhalation, preventing development of a tension pneumothorax. There are times when the occlusive dressing will not function properly, and air will accumulate in the thorax. If an occlusive dressing is applied and signs and symptoms of tension pneumothorax develop, lift the corner of the dressing to allow the chest to decompress. The following short video shows the proper treatment of a sucking chest wound. Tension pnuemo’s are a true emergency; occurring when a hole in the lung acts as a one-way valve, allowing air to enter the thorax with inspiration but, the air cannot escape with exhalation. With each breath, pressure in the chest cavity increases, further deflating the lung. As pressure continues to increase, the mediastinum is pushed toward the unaffected side. This shift causes the vena cava to kink, decreasing venous return. This creates a chain reaction of decreased preload, decreased stroke volume, decreased cardiac output and, ultimately, decreased blood pressure. It will eventually start to interfere with expansion of the lung on the opposite side to the injury, decreasing tidal volume in the healthy lung. Obstructive shock and hypoxia are the results of a tension pneumothorax. If a tension pneumothorax worsens, a mediastinal shift will occur. Tachycardia and hypotension will become profound, followed by decreased level of consciousness. Lung sounds will diminish on the unaffected side, and JVD will occur as a result of decreased venous return to the heart in the absence of concomitant hypovolemia. Tracheal deviation, if observed by EMS at all, is a very late sign and occurs low in the neck. Worsening cyanosis, unconsciousness and eventually death will occur. Treatment: treatment for a tension pneumothorax is needle decompression, a skill typically available only to ALS providers. BLS providers should provide PPV to these patients while quickly transporting to an emergency department or rendezvousing with an ALS unit. Perform needle decompression when a tension pneumothorax is suspected, prior to any other treatment (Contact MCP). Procedure: A 2-3”14 g catheter is inserted into the second or third intercostal space at the midclavicular line just over the top of the rib. It is important to use a needle of adequate length. After inserting the needle into the pleural space a rush of air exits through the needle, immediate decompression of the thorax, and fairly rapid correction of the cardiorespiratory insult characteristic of tension pneumothorax. The catheter is left in place, typically with a flutter valve to allow air to escape the thorax but not to re-enter. Commercial needle thoracostomy kits are available from several manufacturers, or a kit can be made with equipment normally found on an ambulance. A hemothorax occurs when blood collects in the pleural cavity. It can occur with both blunt and penetrating chest trauma. Hemorrhage from injury to the lung parenchyma is the most common cause of hemothorax, but the bleeding from such injuries tends to be self-limiting because of the compressive nature of the accumulating blood, the high amount of thromboplastin (a blood protein that aids in coagulation) present in the lung, and the low pulmonary arterial pressure, all of which serve to facilitate clot formation and stop bleeding. Large injuries to the lung parenchyma and to arteries and/or veins can bleed considerably (more than 1 liter) and lead to hypovolemic shock. Hemorrhage from an injured intercostal artery can be severe, it branches directly off the aorta and is under high pressure. Accumulating blood displaces and collapses the lung, reducing tidal volume and compromising ventilation, leading to hypoxia. If allowed to progress, an uncommon complication termed a tension hemothorax can develop that will present similarly to a tension pneumothorax. The patient with a hemothorax will present with difficulty breathing, decreased or absent lung sounds on the affected side, and a chest that is dull to percussion. In addition, signs of shock will be present, including tachycardia; tachypnea; cool, pale, diaphoretic skin; and hypotension. Treatment: Management of hemothorax begins with oxygenation and IV access along with control of external bleeding. Allow for permissive hypotension, as aggressive fluid volume replacement can dilute remaining blood and its clotting factors, both of which can interfere with the body’s attempts at clot formation, bleeding control and hemostasis. Traumatic asphyxia occurs when sudden and severe crushing forces on the chest results in reverse flow of blood from the right side of the heart through the superior vena cava and into the large veins of the neck and head. The clinical exam of the patient with traumatic asphyxia will reveal upper-extremity cyanosis, bilateral sub-conjunctival hemorrhage, edema, bright red face, and a swollen tongue. Impaired cerebral blood flow may result in neurologic deficits, altered mental status, altered level of consciousness or seizure. Treatment: prehospital treatment of traumatic asphyxia is mainly supportive. Despite the dramatic appearance, the condition itself is often benign in the absence of intrathoracic or intra-abdominal injuries. Provide spinal immobilization if the mechanism of injury suggests the possibility of spinal column or cord injury, and give oxygen if intrathoracic injury is suspected or hypoxia is present. Initiate ALS interventions such as O2, IV, cardiac monitoring and fluid volume resuscitation if signs of shock are present. Injuries to the intrathoracic components of the cardiovascular system often have devastating and immediately life-threatening effects. Common injuries include pericardial tamponade, blunt cardiac trauma, and blunt aortic injury. A pericardial tamponade is an accumulation of blood in the pericardium, resulting in compression of the heart, impaired cardiac filling and reduces cardiac output. Acute pericardial tamponade is most common in patients with penetrating trauma to the chest and upper abdomen, and is rarely associated with blunt force trauma. It occurs more often with stab wounds than with gunshot wounds. After the initial penetrating trauma, the pericardium seals the hole. Continued hemorrhage from the injured myocardium fills the pericardial space. The pericardium is relatively inelastic, and the introduction of even small volumes (60–100 mL) of blood over a short amount of time will result in tamponade. The increased pressure in the pericardium is transmitted to the heart, compressing it and preventing adequate ventricular filling during diastole. This in turn reduces preload, stroke volume and cardiac output. Drastic hypotension rapidly ensues. A result of the cardiac compression is an increased diastolic pressure. A narrowing pulse pressure will develop as systolic pressure falls with reduced cardiac output but diastolic pressure remains high because of cardiac compression. JVD may develop secondary to decreased venous return to the right side of the heart. In addition to the reduced cardiac output, cardiac tamponade reduces myocardial perfusion via compression of the coronary arteries, decreasing myocardial oxygen supply. The classic findings associated with cardiac tamponade include hypotension, JVD and muffled heart tones, a trio of signs known collectively as Beck’s triad. This triad is difficult to identify in the prehospital environment, as auscultation of heart sounds can prove difficult in noisy ambulances. As the tamponade evolves, hypotension and tachycardia will be present, as will a narrowing pulse pressure and possibly pulsus paradoxus (a drop in systolic blood pressure of more than 10 mmHg during inspiration). Treatment: Managing a pericardial tamponade centers on airway control, oxygenation, and support of ventilation and circulation. Signs and symptoms of pericardial tamponade can mimic those of tension pneumothorax, although the presence of bilateral lung sounds can rule out the latter. Patients who are hypotensive, rapid volume expansion with isotonic crystalloid will increase venous pressures, resulting in increased preload and increased cardiac output, elevating systolic pressures. Myocardial concussion describes a form of blunt cardiac trauma that does not result in direct injury to the myocardium. Myocardial contusion occurs when the myocardium is bruised, most often by blunt force trauma. Myocardial rupture is the acute traumatic rupture of the atrial or ventricular wall. Myocardial contusion usually results from blunt force trauma to the sternal area that compresses the heart between the sternum and spinal column, resulting in injury to the myocardium. Myocardial injury can include hemorrhaging within the myocardium, edema, ischemia and necrosis, all resulting in cardiac dysfunction. Myocardial rupture occurs when blunt force trauma results in an increase of intraventricular or intra-arterial pressure significant enough to rupture the myocardial wall. It is most often the result of high-speed motor vehicle crashes; it is almost always immediately fatal. Blunt Aortic Injury describes a spectrum of injury that ranges from small tears in the aortic intima (the innermost layer of an artery) to complete transection of the aorta, which is almost always fatal. Up to 90% of patients with blunt aortic injury die at the site of the accident or within hours of hospital admission. Wherever it falls on the spectrum, blunt aortic injury is a life-threatening injury, and is usually the result of an unrestrained frontal collision or violent lateral blunt impact to the chest. The resulting shearing and tearing forces put stress on the aorta at the ligamentum arteriosum, and tearing can occur. A high index of suspicion, based on an understanding of a rapid-deceleration mechanism of injury and the signs and symptoms of shock, should suggest the possibility of blunt aortic trauma. Treatment of blunt aortic injury includes airway management, oxygenation and ventilation, and fluid volume replacement in patients with profound hypotension secondary to suspected aortic transection. Do not perform aggressive fluid volume administration in patients who are not hypovolemic, as increased intravascular volume could result in greater shear forces on the injured vasculature and worsening of the injury. As with all other trauma, rapid transport to a trauma center is paramount. Chest trauma is a very in-depth and important aspect of trauma care. Know the anatomy, the physiology and how to treat the various injury types. Don’t forget to take a Trauma quiz in the Testing center after this guide to bring it all together!